Nothing ruins a romantic evening like a brawl with lowlifes - especially when one of them later turns up dead and my date, Detective Isabella Cherabino, is the number one suspect. My history with the Atlanta PD on both sides of the law makes me an unreliable witness, so while Cherabino is suspended, I'm paying my bills by taking an FBI gig. I've been hired to play telepathic bodyguard for Tommy, the 10-year-old son of a superior court judge in Savannah presiding over the murder trial of a mob-connected mogul. Excellent! Good plot and superb narration! Would you try another book from Alex Hughes and/or Daniel Thomas May? 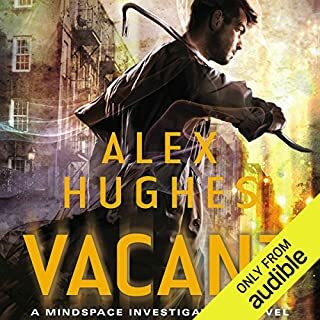 Has Vacant turned you off from other books in this genre? Who would you have cast as narrator instead of Daniel Thomas May? The book should have only be a hour long if the repetitive, feel-sorry-for-myself had been removed.